Bindaetteok!!! Oh how I have missed you..I am sorry that I am so late in writing a post about you. I always wanted to post about you from the time when I started my Korean food blog. Oh..Bindaetteok..You and I go way back.. to the days when I was a kid, sitting on the kitchen floor, making bindatteok all day with my sisters…. From morning till late afternoon, I helped my sisters cook bindaetteok until I was so tired of the smell that at the end of the day, I had no appetite for dinner – which was and still IS a rarity for me!! 🙂 We had to do this because we had to make a LOT of bindaetteok in preparation for big parties or for traditional Korean holidays like New Years and Chuseok (Korean harvest moon). Especially for Korean New Year’s, we always had bindaetteok (빈대떡) or Nokdu Jeon(녹두전) and naengmyeon (Cold Noodles Soup) all ready to serve. We fed all guests that came to pay respects to my parents. Guests came morning, noon and night and Korean style hospitality meant we almost force fed them regardless of what time of day it was and no matter how strongly they said they already ate. Because, we all knew at least half of them were just saying that.. haha.. The great thing about bindaetteok is that you can make it ahead of time and just reheat it when you need to serve. Of course, I have to tell you that bindaetteok DOES taste best when it’s just freshly cooked so if you can make it right before you eat, that’s the best way to eat it. 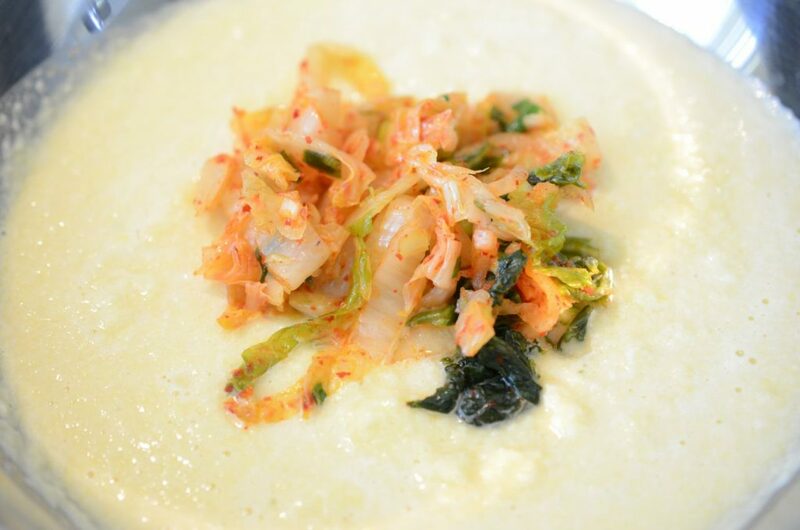 Now, bindaetteok comes in many variations depending on the region but most Koreans will tell you that bindaetteok originates from Northern part of Korea. Scholars say there are different theories of its origin but the one that makes the most sense to me is that it comes from the times of Goguryeo (37 BC – 668 AD : One of the ancient Three Kingdoms of Korea, located in the northern and central parts of the Korean Peninsula and the southern and central parts of inner and outer Manchuria). Which then confirms the theory that the Northern style (이북식 yibukshik) bindaetteok is the original version and also the most delicious. 🙂 You may say that I’m biased and I’m fine with that. But hey, to me- our family’s bindaetteok recipe is the best. Now the worst bindaetteok variations are the ones that mix rice flour or flour with mung beans. 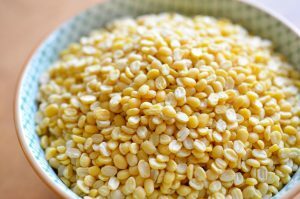 Because mung beans were lot more expensive than flour, restaurants added rice flour or flour to the batter. Bad versions also contain almost no kimchi. 🙁 When you do this, bindaetteok ends up being quite hard and dry. And sadly, very few restaurants get it right. So I usually don’t order bindaetteok at Korean restaurants (both in Korea or in US) unless the restaurant specializes in North Korean cuisine. Soak peeled split mung beans in water according to package directions. The package I bought says 30 mins is enough. In the old days, you had to soak overnight so this is great! You may want to soak overnight just to be sure. This is the package I bought from my local market – try to buy bigger, unbroken mung beans. 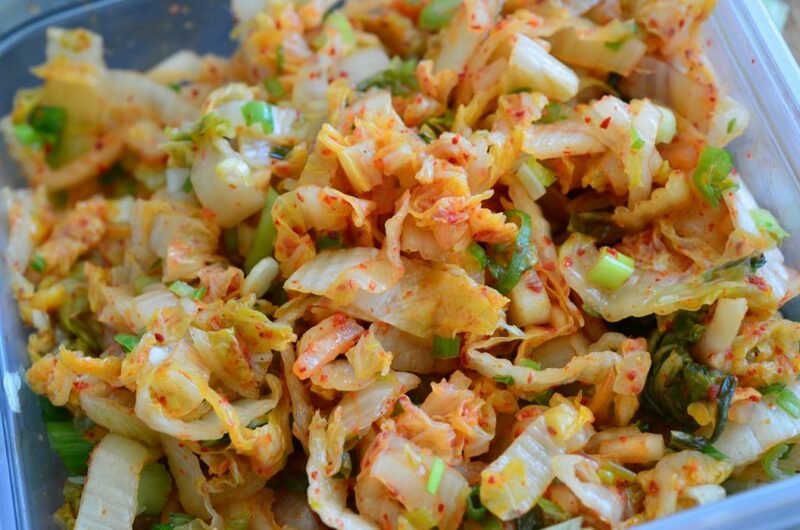 Get 1 cup ripe Kimchi, remove excess seasonings/stuffing and also squeeze out excess liquid. Cut thinly. Chop 2 green onions and add to kimchi and season with a splash of sesame oil (about 1 tsp). Cut 1 green onion into 2 in (5 cm) long pieces. Splitting thicker white ends into halves. Rinse a handful of bean sprouts and drain. *Note, a fully traditional recipe uses blanched bean sprouts but my sister #3 uses it raw and I agree with her that raw sprouts add extra crunch. Also simpler to make. Cut pork belly slices into 1 in (2.5 cm) widths and set aside. 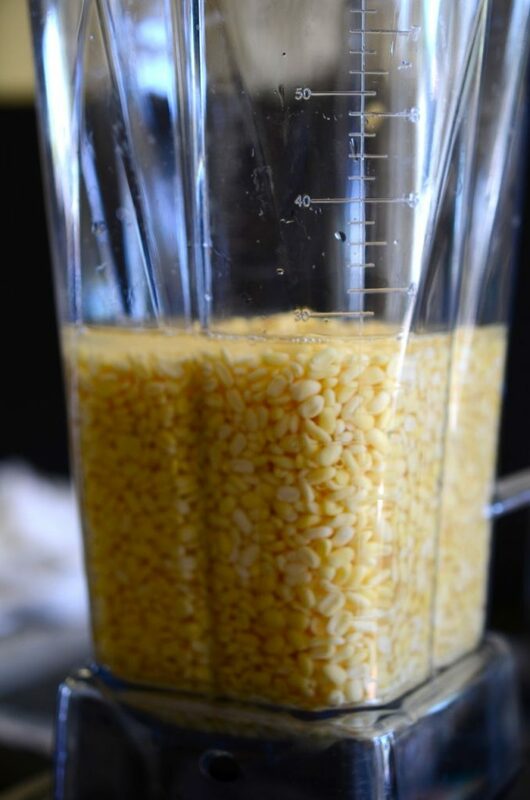 In a blender, add soaked and drained mung beans and enough water to just cover the mung beans. Now to 1/2 of the mung bean batter, add 1/2 of the kimchi and mix. This is how it should look once the kimchi is mixed in. If it looks much more red then you probably added too much kimchi or you have too much kimchi liquid. 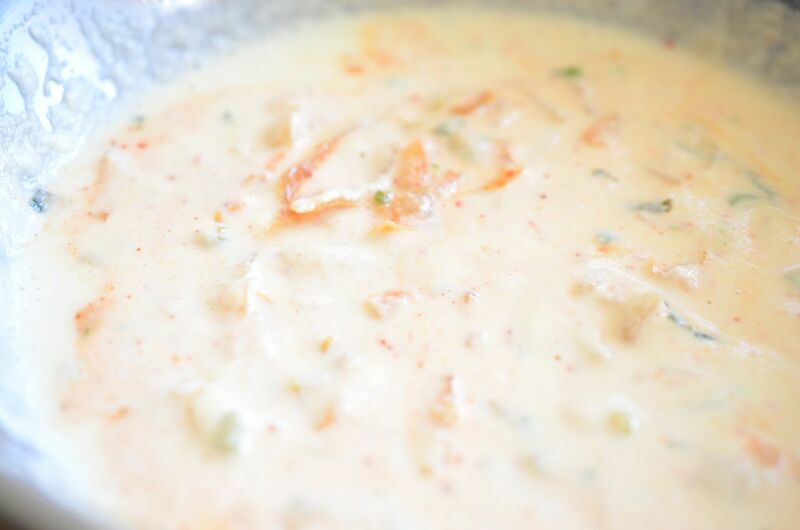 The reason for dividing the batter is because mung bean mix will start to become watery once you add salt. So it’s better to mix a smaller amount, season and make the pancakes before they turn into mung bean water. And then start another batter. Add about 1/8 ~ 1/4 tsp salt to season batter. Heat 2 T oil on medium heat in a 10″ (25 cm) frying pan. When the pan is nice and hot, pour the mung bean batter in the pan. Making about three 4-5 in” (10 – 12 cm) size pancakes. 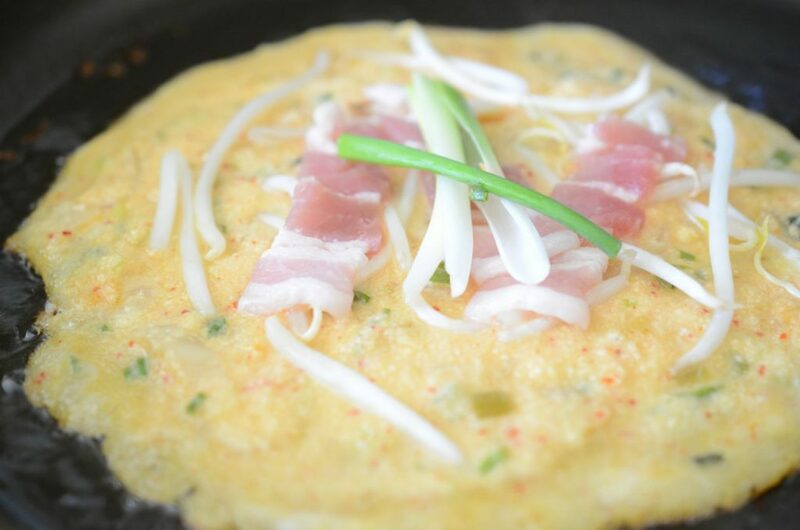 While pancake is cooking, top with few bean sprouts, one to two pieces of pork belly and some green onion. Bindaetteok cooking in pan – isn’t it beautiful?? Korean mung bean pancake (bindaetteok) almost ready! Once edges are brown, turn over and press with a spatula. Pancake is done when it is brown on both sides. Add more oil in between if the pan looks dry. Make the dipping sauce and serve! Best when it’s HOT off the pan. And there you go!! 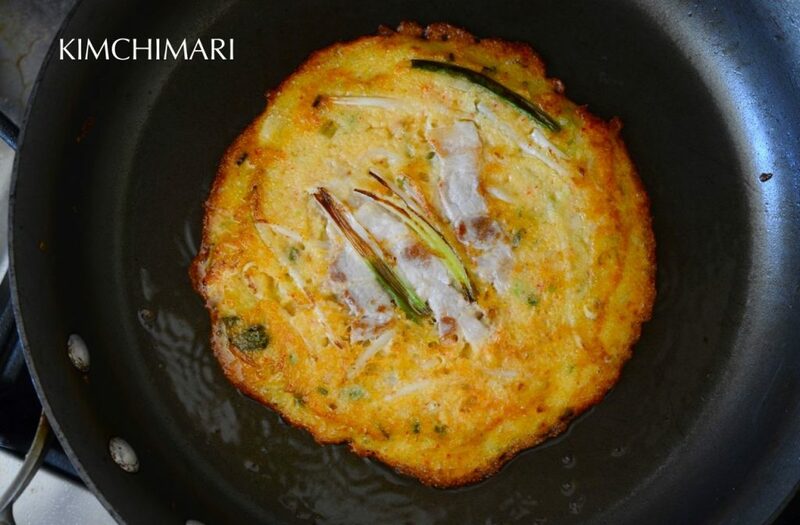 You have a fabulous, gluten-free savory mung bean pancake or Bindaetteok (빈대떡) as we call it! Especially for Korean New Year’s, we always had bindaetteok (빈대떡) or Nokdu Jeon(녹두전) and naengmyeon (Cold Noodles Soup) all ready to serve. 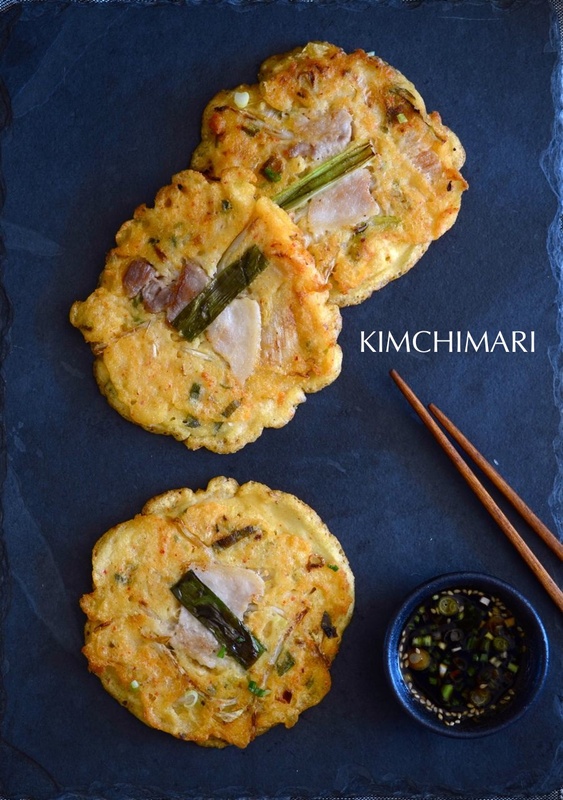 Bindaetteok is made from ground mung bean batter with kimchi, veggies and pork belly added. Soak peeled split mung beans in water according to package directions. The package I bought says 30 mins is enough. 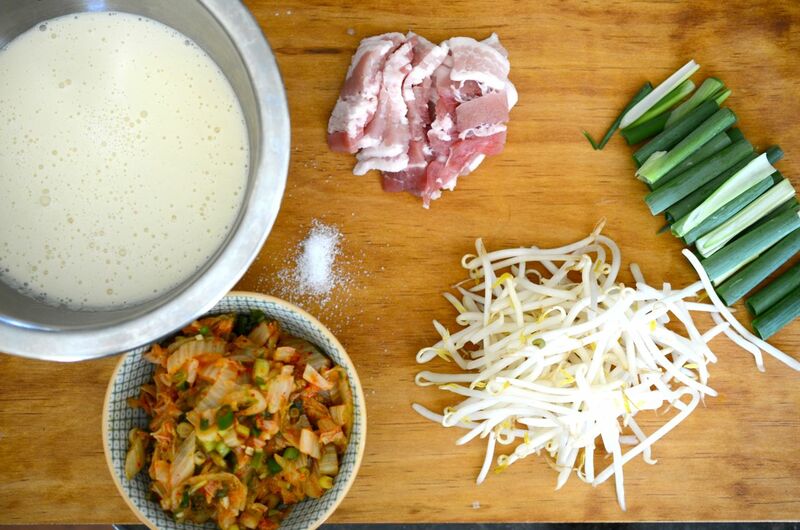 Rinse a handful of bean sprouts and drain..
To 1/2 of the mung bean batter, add 1/2 of the kimchi and mix. The reason for dividing the batter is because mung bean mix will start to become watery once you add salt. So it’s better to mix a smaller amount, season and make the pancakes before they turn into mung bean water. And then start another batch. Make dipping sauce and serve! Best when it’s HOT off the pan. Super Traditional – add rehydrated gosari (bracken fern). I don’t add this because it doesn’t add a lot of flavor. Just a little chewy texture. Also, blanch bean sprouts and squeeze excess liquid before chopping and adding to batter. This is good but more work. Also freeze leftover cooked bindaetteok and reheat. Not as fresh tasting as freezing mung bean as tip #1 but pretty good too! Bindaetteok is soo good with Makgeoli (Korean rice wine) and/or Naengmyeon. 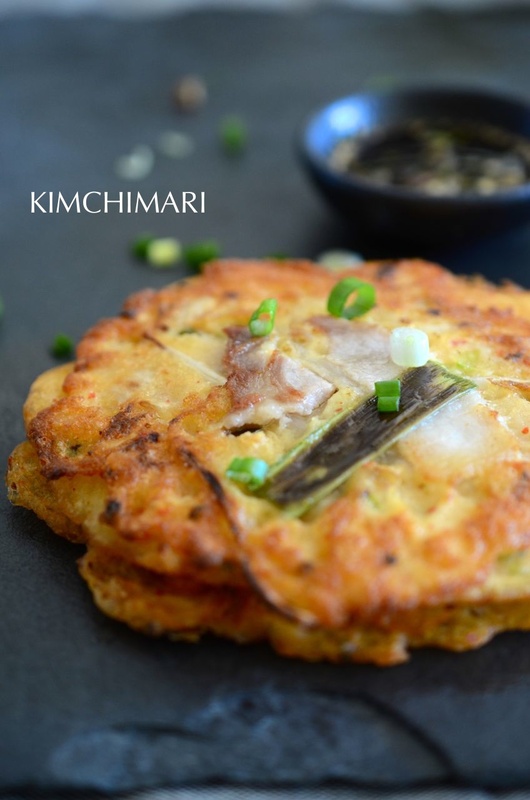 A great party menu for Korean food lovers. I actually recently had a party with bindaetteok – will share the menu in my next post. Till then, eat healthy and by happy! Thank you so much for this recipe and blog. I really appreciate that you put the pork, sprouts, and green onion strips on top of the cooking batter on the pan, instead of chopping everything up and mixing into the batter. I was brought up eating ones made with your method and it really enhances the presentation of the food and consequently the enjoyment of it. The latter method makes a sad mush of the ingredients that lacks texture. 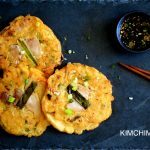 One note about adding rice flour (or grinding soaked sweet rice with the mung bean)–I was told that adding a bit of sweet rice flour helps bind the gritty mung bean batter, so that the pancake holds together better. Please let us know your thoughts on this one. Bravo for another great recipe! Hi Haejin, I APPRECIATE you appreciating the difference of my method!! It really does enhance the presentation, the texture and the enjoyment, doesn’t it?? Yes, adding a bit of sweet rice flour definitely does act as a binder and it does produce a better looking, smoother bindaetteok that holds together better. And this is how most people in Seoul or restaurants make it. So if you are concerned about the presentation, you can def. try adding a bit of rice flour. Me personally, I prefer the loose consistency with no rice flour at the risk of it breaking because adding the rice flour changes the texture – which is fine for most people, just not what I want in my bindaetteok. But everybody has different tastes so you can certainly give it a try and see what you like better. Btw, if you grind the mung bean fine enough it shouldn’t break apart too much. Thank you so much for asking and appreciating!! Hi Jin joo, I love your recipe for your pindaetokk. It’s this “migook oma’s”. Favorite Korean food😊‼️🇰🇷🇺🇸. We’re an American family with three (of our five) children adopted from Korea and then China. Our Chinese daughter is described as a Korean wanna-be by her Korean born sister. She can pull it off very well (and is a linguistic major at university)… my face, on the other hand, gives me a more difficult time convincing people with my round hazel eyes! But my heart is definitely KOREAN. I’ve convinced quite a few halmonis over the years both in Korea and New York . Hi again. It’s US who have been blessed by these kids and their remarkable country and heritage😊🇰🇷🇺🇸‼️SBP arrived in 1976 at age 3, DKP was 7when he arrived in 1979. Baby MVP was 10.5 in 2002 when the other girls and I went to pick her up in China. That’s proved to be quite an adventure😑🙄😊. Two bio kids are 49, 46. Then 45, almost 44 and 25 yr old. She kept me young or reintroduced me to elementary school homework. It was easier with any ‘only’ child than it had been with KCP and “three little ones ” as we called them. When we got to MVP’s province the social worker gave me a quizzical look and said “you have children from Korea?” She then informed KCP & I that our new daughter’s name in Chinese characters was china and Korea (roughly spelled Zhong Han!!!!!). The Lord sure works in mysterious ways…but if you are paying attention you see His work everywhere. xoxo. Talk again soon. Jacki. ps: I’ve been to Korea 13 times. I love it so much. OH! I am sorry I meant to also add – I totally know what you mean by The Lord works in mysterious ways. I always look back in my life and realize His touch and guidance everywhere. I thank God everyday for that. Thanks so much again. Hello Annie!! Oh, the pleasure was all mine..thank you thank you for passing my blog link around. You are just awesome!!! And wow, is that how you make Dosa?? Will you be putting up a recipe? Dosa is really one of my absolute favorite foods. I used to eat it all the time when I lived in India many eons ago… BTW, yes, I am suddenly getting a lot more traffic and also many more likes on my facebook page. Thank you again! OK! Thank you for this! 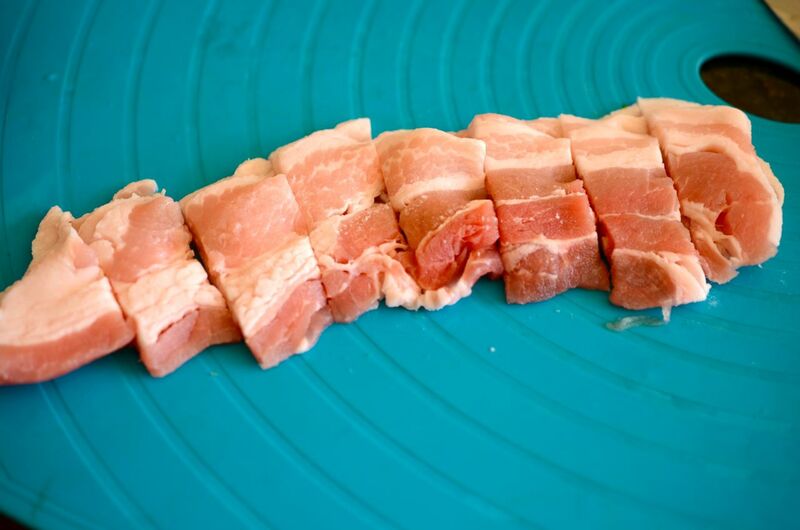 I actually have in my kitchen in Wales a lot I could substitute– bacon, some kimchi made with carrots and parsnips. 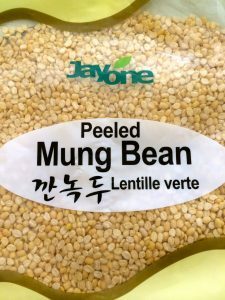 I’m just wondering about the “peeled” mung beans and whether it’s ok to just use plain old mung beans. i think it’s going to have to be. Love your blog! Hi! Great to hear from you! Well, bacon and Kimchi will just make any meal special. :)) So, you can try using plain, unpeeled mung beans because I mean, that’s how we did it in the old days. Whole mung beans need to be soaked longer (overnight) and then you don’t have to get rid of ALL the peels just enough to not make your batter green and probably too fibrous. 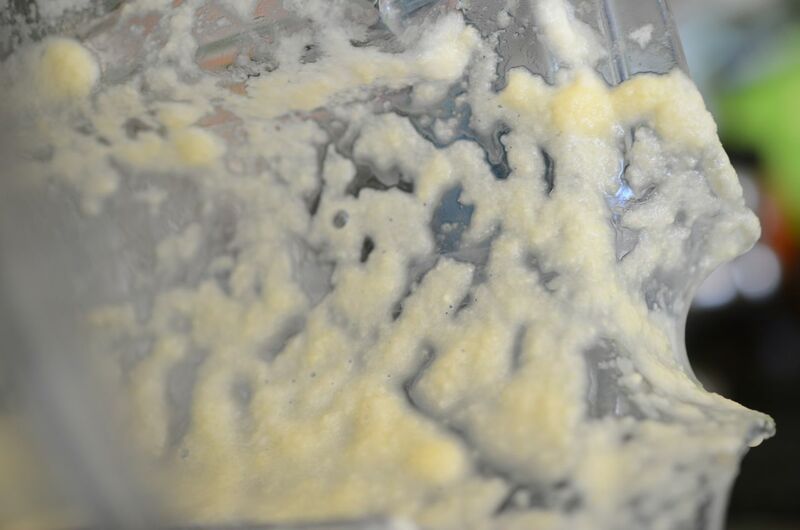 After it is soaked, you can massage it with your hands a lot and then add more water and green peels should float to the top and then you can get rid of it by pouring out the excess water with peels in them. You can also just flash blend (just do quick blend in few short bursts) soaked mung beans in the blender, just enough to get the peels off and to break the mung beans.And then add water and wash peels away. If you ended up not getting rid of the peels, I would LOVE to hear how it turned out. Cause I personally never did it that way myself. Thank you and Happy New Year! Thank you for writing all that. Just seeing it. What I decided to do was to soak “urad dal” which looked the most like the legumes in your photograph. Also I couldn’t find bean sprouts so my plan, tomorrow, is to very thinly slice radishes. They’ll have to do 🙂 And thanks for following my blog! I’m so grateful to you! These are SO good, even with all my substitutions! Hello and thank you? As usual a lovely blend of must try recipe, personal and historic anecdotes and gentle language tutoring. I love it! Thank you.